Burn Ban Lifted for Wilson County - Eagle Creek V.E.S. 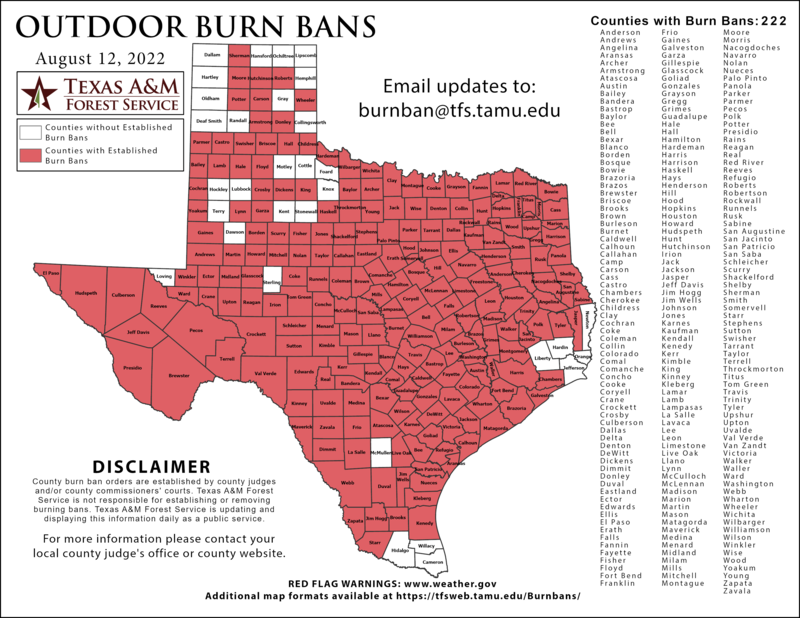 Effective September 17, 2012, the burn ban has been lifted. ALL BURNING MUST BE DONE IN THE UNINCORPORATED AREAS OF WILSON COUNTY (NOT WITHIN THE CITY LIMITS OF ANY MUNICIPALITY). All burns must follow the TCEQ Outdoor Burn Regulations for Texas. All burns other than these Exceptions (Firefighter Training, Fires for Cooking, and Domestic Waste Burning) must be permitted through the Wilson County Health & Public Safety Office. · Firefighter Training must be done by a Fire Department. § (2) used exclusively as a private residence for no more than three families. o Be burned on the property where it was produced. For example, kitchen garbage, untreated lumber, cardboard boxes, packaging, clothing, grass, leaves, and branch trimmings. o Be monitored during burning by an adult with a means of extinguishing the fire. · Cooking Fires should be done using caution, with a way of controlling and keeping the fire from spreading and monitored during burning by an adult with a means of extinguishing the fire. All other burns will be subjected to the permitting process. Call the Wilson County Health & Public Safety Office at (830) 393-8503 during normal business hours (8 AM -1200 noon and 1 PM - 5 PM) on the day you would like to burn. Weekends and/or Holidays burn permits must be obtained on the day before the Weekend and/or Holiday between 1:30 PM and 4:30 PM. (The Fire Weather Forecast Information by the National Weather Service for weekends is posted between 1:30 PM and 3:30 PM). Who: What is the Name of the responsible party doing the burn and a phone number at the burn site where the responsible party can be reached. What: What you are burning. Where: What is the Address where the burn is being done. When: What Time are you going to burn? How: How are you going to control the fire and keep it from spreading? · A responsible party must be present while the burn is active and the fire is progressing. · Winds must be from 6 to 23 mph during the burn period. · Burning during temperature inversions or air stagnation advisories is prohibited. · Post someone to flag traffic if at any time the burning causes or may tend to cause smoke to blow onto or across a road or highway. · Keep fires downwind of, or at least 300 feet (90 meters) away, from any neighboring structure that contains sensitive receptors. This requirement may be waived only with the prior written approval of whoever owns or rents the adjacent property and either resides or conducts business there.